It's 4am and your alarm is ringing. You know exactly what's going on, no need to think about why it's ringing - you are straight out of bed. You feel a sense of calm and good nerves buzzing around your body. 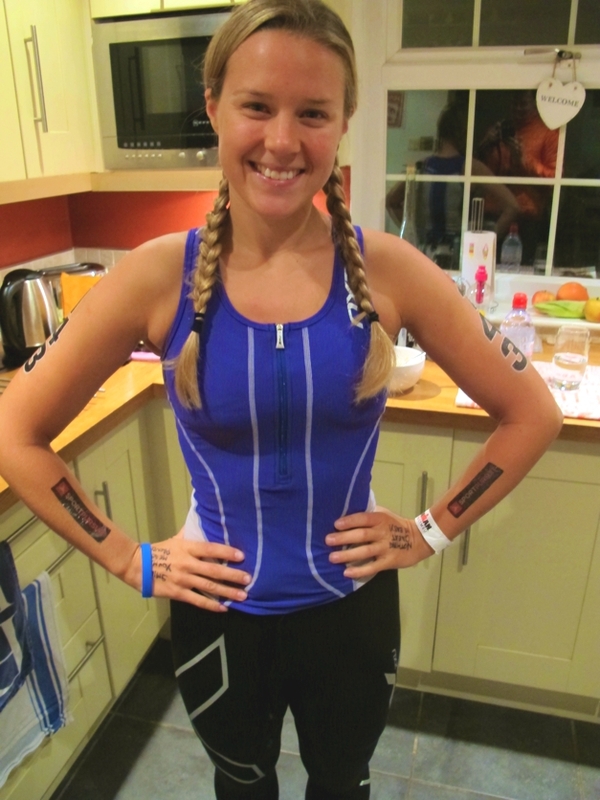 You dress in your tri-suit, brush your teeth and put your race tattoos on. You are branded now and feel like a pro. This is the day you've been waiting for, working for, dreaming of - you are ready to battle it out for that medal. You are ready to become an Ironman. 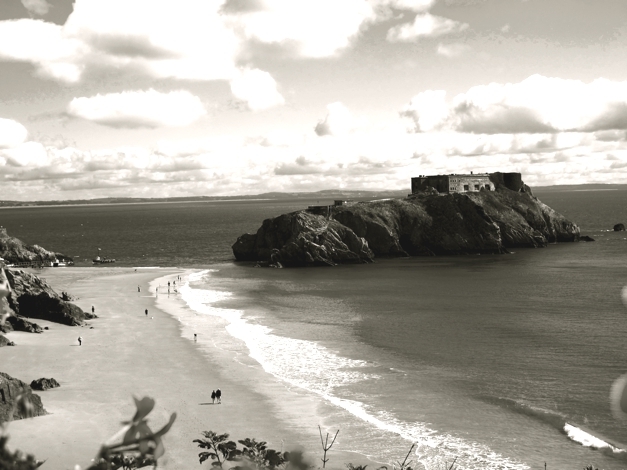 Ironman Wales is hosted in Tenby and the surrounding Pembrokeshire countryside. 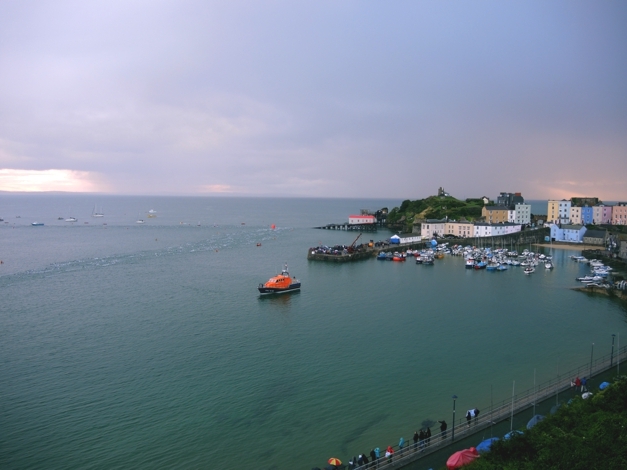 The race brings over 7000 people to Tenby and £4million to the local economy. We arrived in Tenby at 5:15am it was pitch black dark and raining. The normally sleepy town was buzzing with activity. I was pretty excited and keen to get cracking. A long day ahead, a long time for strengths and weaknesses to play out on the course. Time to put myself to the test. I said goodbye to Charley, Mum and Nicola outside transition - thinking how lucky I was they would be with me until the end. A long day for them too - supporting an Ironman is not a 9-5 job! 1800 competitors gathered by the transition exit and walked to the beach for the swim start. I bumped into Tarran who I know through Twitter, that was nice! Stepping foot on the beach, I could barely contain myself with excitement and let out a little squeal. The day was here, just a few more minutes to go. The sun rising over the horizon created a silhoutte backdrop on the scene. A moment to remember. We sung the Welsh National Anthem (well I say we..) then we were off! Diving and plunging into the sea, everyone jostling for space. 2.4 miles, two laps of the course with a brief section running on the beach between the laps. 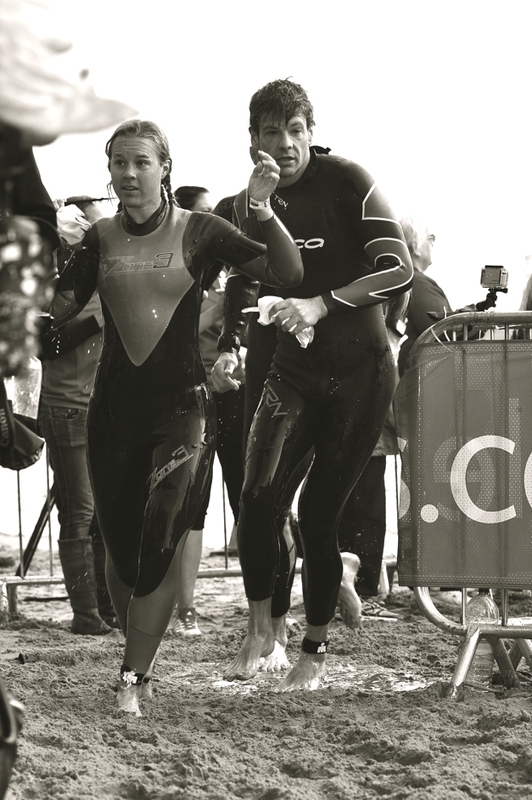 It was fairly brutal amongst the competitors, the sea was choppy, my neck was stinging from the wetsuit and salt water. I kept my head down and finished in 1hr 11minutes and 8th position. The 1km run uphill to transition was a blur I just remember the buzz from the supporters. 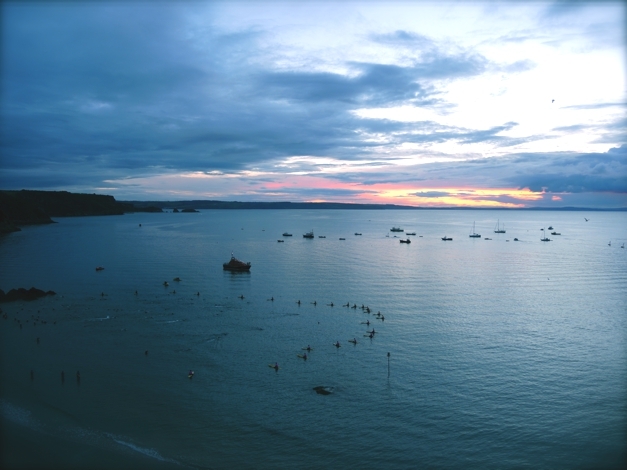 Tenby had an incredible atmosphere from the start. Transition 1 took me 10 minutes, I couldn't wait to get out on my bike and take on the Welsh hills. I had been warned many times about how "challenging" or "hilly" Ironman Wales was - I think you have to experience it to grasp it. A good way of describing the course would be "It's either up or down". The hills were relentless. 112 miles is a long way to cycle on any given day, with this course (beautiful as it was) my legs were feeling heavy very early on. The weather wasn't great, we had torrential rain for about 2 hours. Others moaning about it made me smile. I knew the sun would come out, we were just having to work for it. 65 miles in on the first lap of the bike is Heartbreak Hill. The crowd support was immense, it lifted me more and more as I climbed it, it felt effortless. Right at the top were my family beaming at me and shouting encouragement. A Tour De France moment. I thought to myself, that had been the toughest hill yet and the crowds were there to help - don't worry about the tough parts of the day, they will be there to help me through. After Heartbreak Hill we had another 42 mile loop of the same course. It was a long, lonely sufferfest. By this point most of the cyclists had spread out you were on your own battling it out, watching your average speed drop. Just keep the legs spinning... hill after hill after hill. I kept my nutrition up and focused on staying hydrated. The thought of running a marathon after this was weighing me down mentally, I tried to ignore it. After the second climb up Heartbreak Hill, I descended into Tenby. Coming up the hill on the opposite side of the road were my fellow competitors on the first lap of their run. The look of pain and agony in their faces was enough to make anyone worry. As I came into transition, I was speechless. I knew I would get through the marathon but I had no idea how. As with all endurance, this was going to be a battle of the wills - mind vs body. Coming into transition for the second time, I felt as though I was running below empty. I was tired and everything ached, I'd had a challenging day so far but still had a marathon to run. I'm also not a runner. I've spent most of my training on cycling and endurance work, hoping that the fitness I've gained from those will see me through the run. I ran 13 miles in a half ironman 3 weeks ago, but had never run over that distance. This was my 3rd triathlon. These thoughts were not helping me, I needed to keep the faith! What I did have was faith that I could dig deep. 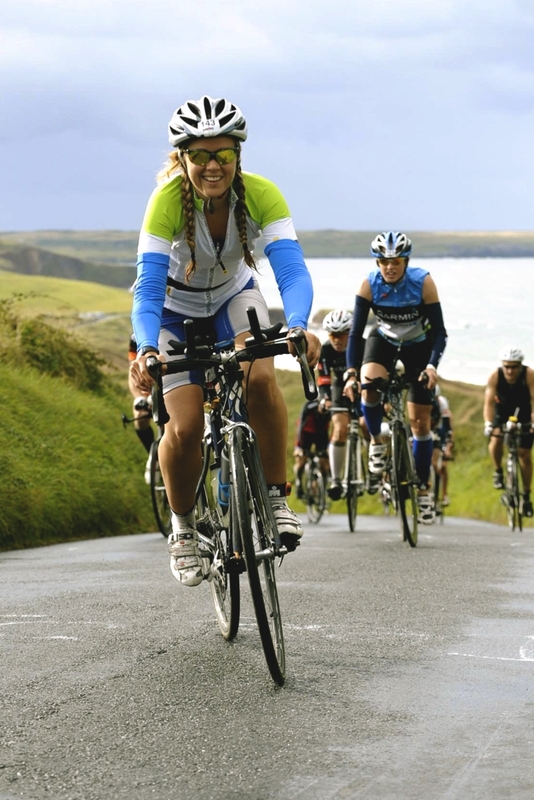 Experience built up over years from 200 mile bike rides in bad weather, where your only option is to keep going. Days in the mountains when you need to keep going to get to safety. I kept faith that when the going gets tough, I could pull it out of the bag, I could make it happen and deliver the goods. I felt proud and urged myself to keep going. The crowds put a lot of effort into supporting and seeing us through to the bitter end (some competitors took the full 17 hours to complete the race finishing at Midnight). We all had our names on our numbers so they would shout out "Go on Soph!" in encouraging thick Welsh accents. 1000 volunteers helped to make the race a success. Many were teenagers at the aid stations, so friendly and supportive. Kids along the side of the road wanted to high five you as you ran past, they wanted to make you feel special, that what you were achieving was worth the physical and mental turmoil you were in. When the pain got too much, I deployed tricks to push harder. I told myself that this was the normal way of feeling and just to get on with it, most of all I didn't want to walk. I focused on doing whatever it took to keep running. Finally, after close to 13 hours of non-stop racing I had completed the final lap and was able to turn left onto the sea front and the Magic Carpet. At the race briefing Paul Kaye had said "we call it the Magic Carpet because it instantly transforms pain into pleasure". I'm actually welling up now writing this and re-living the moment. Thank you for reading this and giving me the opportunity to share it with you and feel that elation again! A final sprint finish saw me cross the line in 12hrs 56 minutes, with Paul Kaye saying "Sophie Radcliffe, You Are An Ironman"! I thought I would cry at the finish line. I had been holding back the tears all day as there had been so much emotion from the crowds. Instead I felt happy! I waited for Ian, a friend I had made on the course to congratulate him and then went to find my wonderful supporters who were so proud and happy. 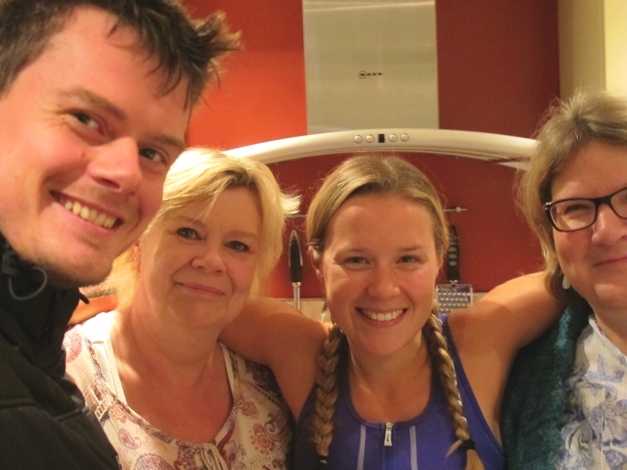 Mum was over-the-moon, jumping up and down like a teenager at a slumber party. AMAZING. By now it was dark and raining again. I collected my finisher's t-shirt, grabbed a slice of pizza and headed home to get warm. As we drove out of Tenby I could see the athletes slogging up that long hill in bad weather and felt the pain they must be in. Back at home we had champagne, Chinese takeaway and the chocolate cake Charley had made for me. I couldn't really eat much of it but loved the fact that it was all there. We talked non-stop about the race, exchanging stories and went to bed happy. This was my first Ironman and first marathon. My goal was to finish and with a smile on my face. To have completed it in sub 13 hours made me very happy indeed. It's the journey... Working towards a big goal that is totally within your control and not reliant on anyone else offers a different experience to other goals we may be working towards in life. 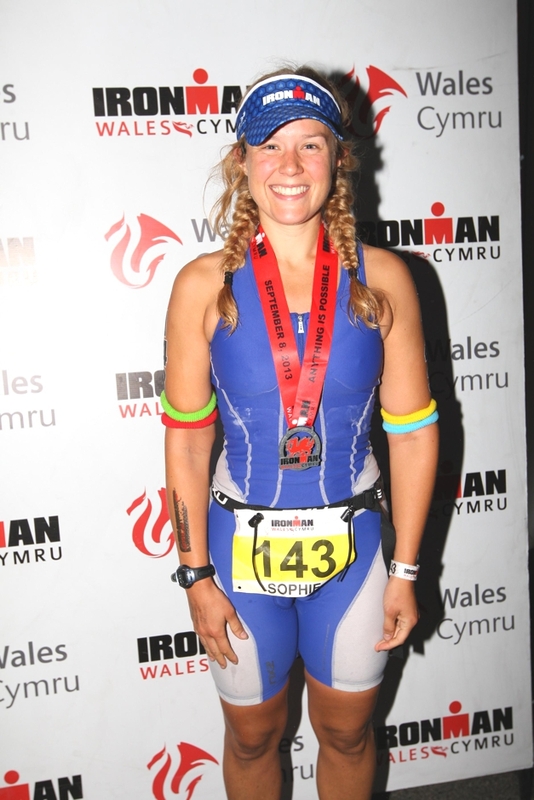 Ironman Wales was a big challenge, I loved it. It's an opportunity to put yourself through an intense experience and see what you can deliver when it's all to play for. I've changed in the process of becoming an Ironman, that's the beauty of experience - we learn and adapt. I know now more than ever that I love endurance sports and can't wait for future challenges. If you have any suggestions get in touch! If you are tempted and keen for a challenge, I can't recommend it enough! 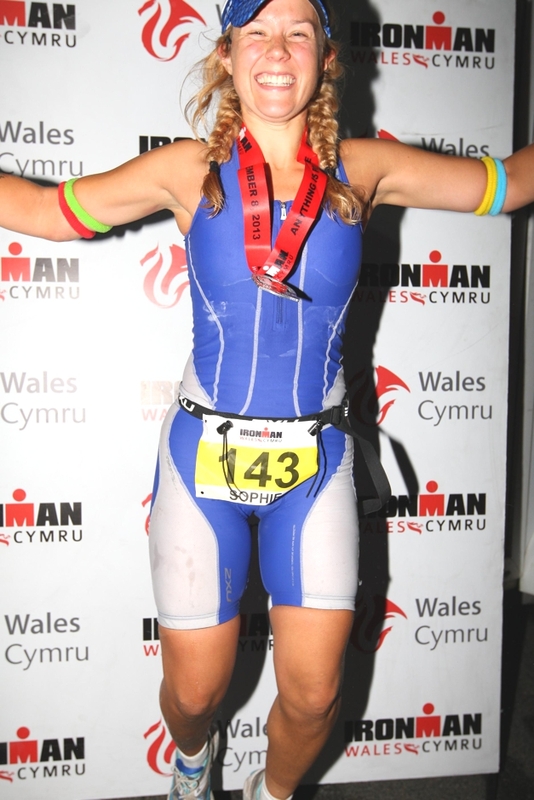 Sign up here: http://ironmanwales.com/enter-now Surely this guy can convince you? !